All very common phrases heard from generation to generation. We’ve all been told to correct our posture at some point in our lives. No matter what job we have or what our daily activities include. Posture is vitally important to be aware of. If we’re not aware of how we’re carrying ourselves, we risk a lot of discomfort and in bad cases, serious injuries. Poor posture not only strains your muscles, it can alter your skeletal structures over time and put stress onto your internal organs. When the muscles that are responsible for keeping us upright are forced to overstretch, it causes the antagonistic muscles to tighten as they struggle to maintain balance within the body. When this happens, we can experience all types of aches and pains. Knots within the muscle tissue form over time, and joint discomfort becomes apparent. The tightness in the muscles can trap nerves, causing excruciating radiating pain across whole areas of the body. In serious cases, a constant habit of bad posture can result in a spinal fusion or herniated spinal disc leading to restricted mobility and even paralysis. 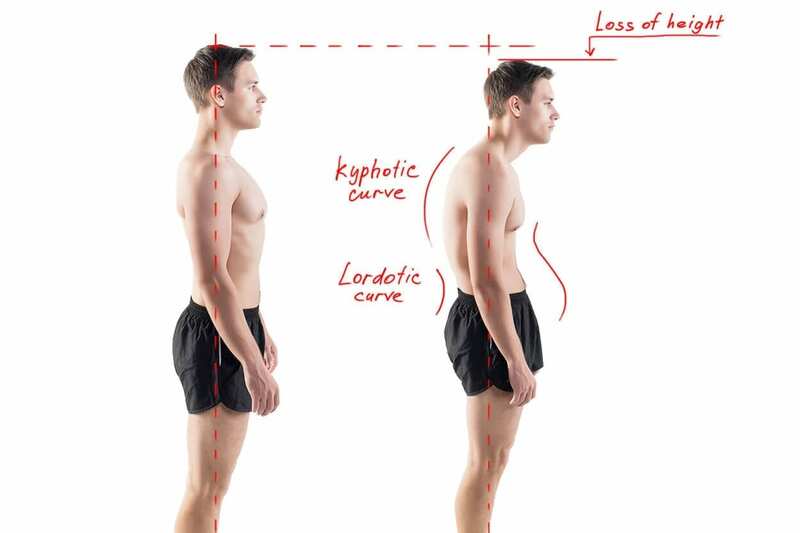 Why do so many people have bad posture? While some people are born with spinal abnormalities or uneven limbs, causing a drastic imbalance and in serious cases requiring corrective surgery, it is found that the majority of people have simply developed a bad habit. Many aspects of life can affect the way we carry ourselves, whether it be a subconscious line of defence or a conscious reaction to better fit into our surroundings. Our bodies have a whole language of their own that words don’t express. When we’re fatigued we tend to slouch, lollop around and lean against things, rather than supporting our own weight. If we’re feeling angry or uncomfortable, we cross our arms, cross our legs, furrow our brows. When we want something, our bodies move to point towards whatever it is, this is obvious a lot of times in the direction your feet are aiming. It’s all subconscious. When we’re proud we hold our heads high and strut about the place like a horny peacock. Crass, but it’s a good comparison. The good news is, even subtle adjustments to our surroundings and to ourselves can make a radical difference. Evenly distributing our body weight comes first on this list. How often do you find yourself favouring one foot to the other? The goal here, is to be aware of your feet when you’re standing around. Instead of slouching or leaning to one side, stand up straight with your feet parallel to each other about 5 inches apart. If you feel your pelvis tilting upwards and outwards, a common problem for sufferers of lordosis, make the extra effort to tuck your bum inwards by bending your knees slightly and realigning the spine. Stand with purpose. Your back should be straight but all the while comfortable and relaxed. No need to be military-stiff. Keep your shoulders loose and relaxed, taking a few good deep breaths can help you naturally achieve this. They should not be rounded forwards or appear slouched. You’ll notice when practicing good posture, you feel stable and grounded, because you literally are. As a bonus, you appear more attractive and people will receive the impression of a confident person. The best advice, when tackling any daily task, is to be simply be aware. Just be aware of your stance. Housework is a big one. Ask yourselves if the ironing board is high enough so you’re not bending too far over and straining your back. Are you using the strength of your legs to bend and pick things up? Sweeping, vacuuming, mopping; make it a dance! Bend your knees, back straight, feet grounded. Have a little wiggle, put on some music and have fun with it. You might as well. It’s a fantastic idea to stretch it all out once your done as well, this will prevent stiffening of tired, used muscles. Computer people; pleeeaassee make sure you have your screen at eye level. If you are craning your neck upwards or downwards you’re going to have short term and possibly long term issues with your neck and surrounding muscle groups. I solve that problem by simply piling a stack of hardback books on top of each other until the ideal height is achieved, then balancing my laptop on that. 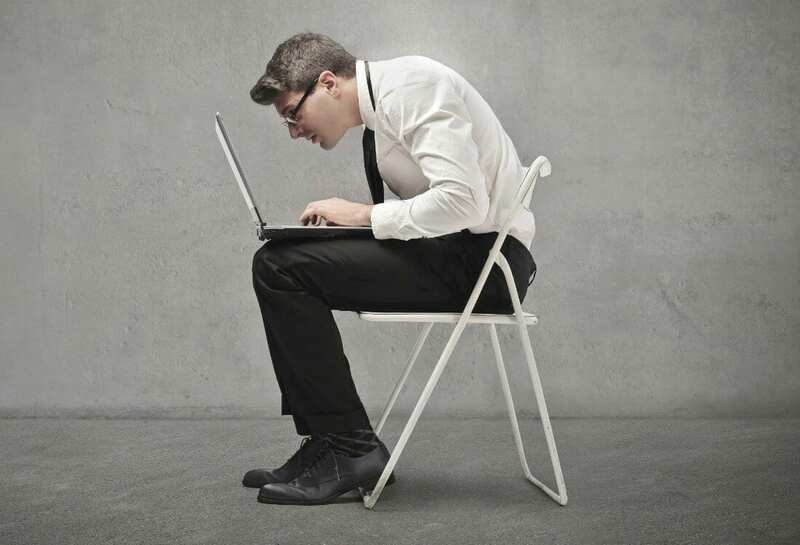 I have an extremely long torso so when I sit up properly in my chair, there is no way I could safely work with the laptop being at normal desk-level. Ideally, I should invest in a separate keyboard, to not strain my wrists when typing. 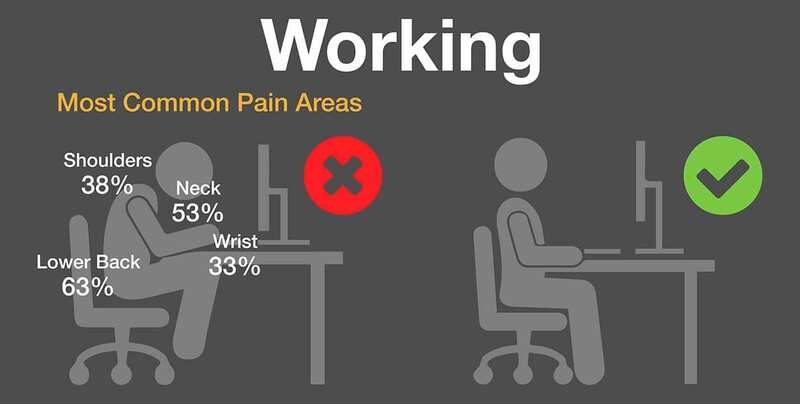 Forearms should be parallel to the floor when fingers are at the keyboard. It’s a cheap solution for now, and saves my neck from straining at least. The point is you don’t need to have fine-tuned ergonomic installations to make an improvement. Don’t stress out if you can’t afford a fancy solution right away, just a slight adjustment can make a huge difference. Your body will soon tell you if something is not balanced, the trick is having the awareness to listen to it. It should be second nature, certainly not something to stress about. Quick story; my former boss got badly injured through poor posture. His office set-up was not ideal. A cramped desk forced his computer monitor to be side-by-side with the keyboard, instead of behind it. Whenever he was working at his computer, his head would be facing the monitor to the right, away from the rest of his body. After a few years of this, his cervical spine eventually herniated in two places. He couldn’t work for 6 months as he recovered, and to this day he still experiences excruciating pain. Thankfully, the doctors were able to determine the cause of the injury and his office soon got a makeover. The space is now extremely ergonomically satisfying, but even so, he gets his assistant to do most of the computer work. Receiving bi-weekly treatments from both a chiropractor and massage therapist, he is able to lead a relatively pain-free day-to-day life. BACK TO SITTING…IN THE CAR! Taxi drivers will tell you all too well. If you’re not properly supported on the job you won’t last more than a week… Well you could, just in a lot of stiff pain. 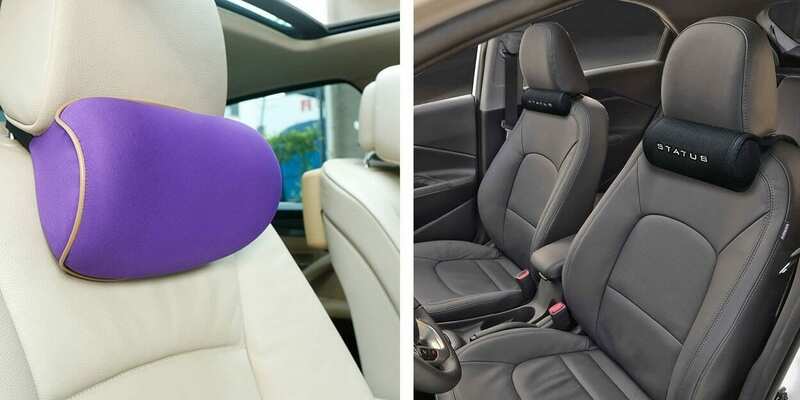 I myself purchased a padded back-supporting seat topper for the worthy fee of 30€ at my local car shop. When doing a lot of driving, I find I need it. For short trips, it’s just not necessary. Alternatively, you could use a folded blanket for that extra cushiony-support. At the School of Natural Health Sciences you can learn more about good posture, balancing the body, massage therapy and more, in the form of internationally recognised qualifications. With over 50 online courses to discover, there’s no limit on how far your knowledge could take you. Better your career all from the comfort of your own home and enrol today! Take a look at the courses on offer.